Cores & Effect is a boutique Pilates & wellness studio focused on improving overall fitness, wellbeing and awareness. We inspire individuals to live a healthy lifestyle understanding the importance of a healthy mind, body & spirit connection. We provide a beautiful welcoming exercise space basking in natural light. We provide a separate private teaching room for groups of max 10 clients for workshops, teacher training and seminars. We offer a 360 sqft outside elevated deck space that can be used for shoulder season spin class or a summer seated area to relax between appointments. We only offer one to one, semi-privates and classes with up to five people. Making the most of individualized attention-modifications, so you can feel successful results. Private sessions available, request a specialized class created just for you or for your specialized group. We offer you Mindbody software – cutting edge software system that allows you the convenience of purchasing your sessions, worshops,pre-signing into classes & checking your account status ONLINE as well as in-person at our studio! We have free parking in super easy access of the studio. Enhances a stress free experience! A fully equipped Pilates studio for private, and semi-private sessions that take advantage of all the fantastic equipment developed by Joseph Pilates to supplement mat work. 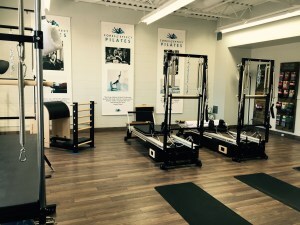 The Ladder Barrel – Pilates equipment encourages alignment and stability.